Des Melanka and her cameraman spent a day picking rhubarb, watching us make ketchup and finally put our story together for a spot on the news. Thanks for the spot! Here is the link to the video. We are just completing our third year of creating. The first year we collected apples and crab apples in the autumn and rhubarb the following summer and that sure seemed like a lot of local fruit. As we grew over the last 2 years we have been gifted with more and more local fruits and are totally surprised with the treasures that grow in this city. 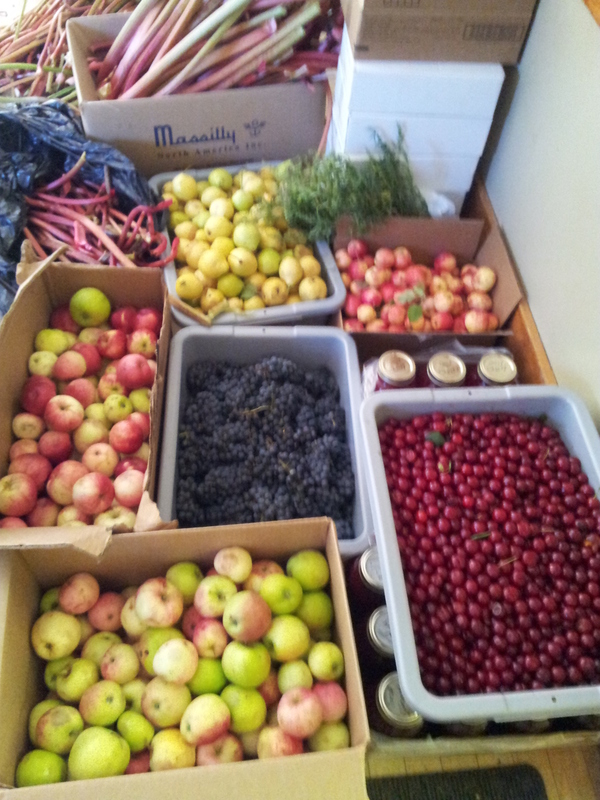 This photo shows the bounty gathered in a couple of days in the middle of September when we were in our harvesting frenzy. If you look closely you will see rhubarb in all colours, local pears, tarragon (for crab apple tarragon jelly), boxes of local apples and sweet little crab apples, sour cherries, and in the middle - local concord grapes. The gold lids around the cherries are full of juices we have been busy producing as a way of saving this bounty for winter work. What is not in this photo are the following locally rescued treasures we have tucked away for creative time in the winter: local apricots, honey berries, saskatoons, lovely plums (golden yellow, red and purple), some chokecherries and a lovely variety of local herbs. What will we make with these? Some are destined to go into products already on our list, but there are some new fruits that will be carefully considered. The honey berries will probably go into something for the Compliments line as there is only a small amount and we want to highlight them. The plums will be fun as there are enough to create a run big enough to go into the Seasonal Specialties listing on the web. The apricots will go into Apricot Amber - a great condiment for cheeses in the Compliments line. The herbs will find their way into a variety of items over the winter, so look for new taste options. Finally we have a challenge with the grapes. It is the first year with enough lovely concord grapes and we will make a condiment with them. It will be a challenge to keep the lovely flavour and keep it on the savoury side. However we do like challenges, so look for it in the Compliments lines as the gift season opens. How will you find these new items? If we have over 250 jars they will be in the Seasonal Specialties section on our list of Preserves for Sale. The others will find their way into the local Farmer's Markets or craft and gift shows. It is the advantage of shopping locally - you get to be our tasters for new products or to purchase the small unique craft offerings. Anyone can send us a request if you interested in these special batches that are not listed on the web and we can tell you what is available at that time. 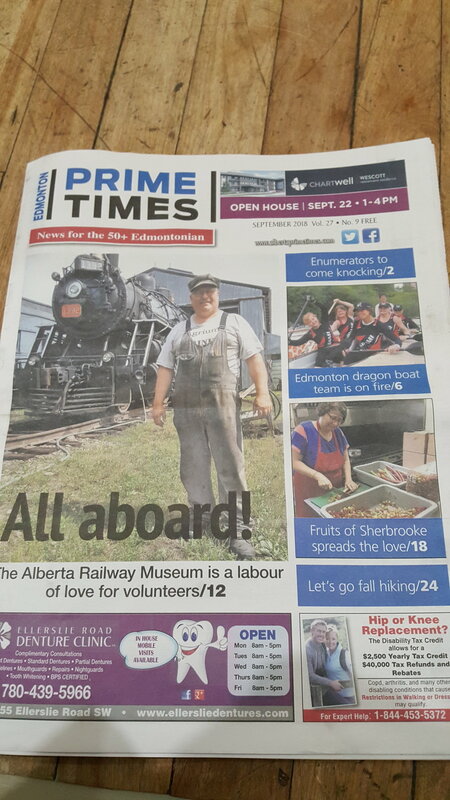 Thank you to our supporters in the Edmonton, St. Albert and Sherwood Park area. It is amazing what you grow and have chosen to share with us.